The national team has played 820 Test matches, winning 386, losing 222, drawing 210 and tying 2. As of March 2019[update], Australia is ranked fourth in the ICC Test Championship on 104 rating points. Australia is the most successful team in Test cricket history, in terms of overall wins, win-loss ratio and wins percentage. The Australian cricket team has played 932 ODI matches, winning 566, losing 323, tying 9 and with 34 ending in a no-result. As of March 2019[update], Australia is ranked fifth in the ICC ODI Championship on 102 rating points, though have been ranked first for 141 of 185 months since its introduction in 2002. Australia have made a record seven World Cup final appearances (1975, 1987, 1996, 1999, 2003, 2007 and 2015) and have won the World Cup a record five times in total; 1987, 1999, 2003, 2007 and 2015. Australia is the first team to appear in four consecutive World Cup finals (1996, 1999, 2003 and 2007), surpassing the old record of three consecutive World Cup appearances by the West Indies (1975, 1979 and 1983) and the first team to win 3 consecutive World Cups (1999, 2003 and 2007). The team was undefeated in 34 consecutive World Cup matches until 19 March at the 2011 Cricket World Cup where Pakistan beat them by 4 wickets. It is also the second team to win a World Cup (2015) on home soil, after India (2011). Australia have also won the ICC Champions Trophy twice (2006 and 2009) making them the first and the only team to become back to back winners in the Champions Trophy tournaments. The national team has played 116 Twenty20 International matches, winning 60, losing 52, tying 2 and with 2 ending in a no-result. As of March 2019[update], Australia is ranked third in the ICC T20I Championship on 120 rating points,. Additionally, the team made the final of the 2010 ICC World Twenty20, in which they lost to England. A highlight of Australia's early history was the 1882 Test match against England at The Oval. In this match, Fred Spofforth took 7/44 in the game's fourth innings to save the match by preventing England from making their 85-run target. After this match The Sporting Times, a major newspaper in London at the time, printed a mock obituary in which the death of English cricket was proclaimed and the announcement made that "the body was cremated and the ashes taken to Australia." This was the start of the famous Ashes series in which Australia and England play a series of Test matches to decide the holder of the Ashes. To this day, the contest is one of the fiercest rivalries in sport. The 1930 tour of England heralded a new age of success for the Australian team. The team, led by Bill Woodfull – the "Great Un-bowlable" – featured legends of the game including Bill Ponsford, Stan McCabe, Clarrie Grimmett and the young pair of Archie Jackson and Don Bradman. Bradman was the outstanding batsman of the series, scoring a record 974 runs, including one century, two double centuries and one triple century, a massive score of 334 at Leeds which including 309 runs in a day. Jackson died of tuberculosis at the age of 23 three years later, after playing eight Tests. The team was widely considered unstoppable, winning nine of its next ten Tests. The Australian team put the result of this series behind them, winning their next tour of England in 1934. The team was led by Bill Woodfull on his final tour and was notably dominated by Ponsford and Bradman, who twice put on partnerships of over 380 runs, with Bradman once again scoring a triple-century at Leeds. The bowling was dominated by the spin pair of Bill O'Reilly and Clarrie Grimmett, who took 53 wickets between them, with O'Reilly twice taking seven-wicket hauls. Test cricket was again interrupted by war, with the last Test series in 1938 made notable by Len Hutton scoring a world record 364 for England, with Chuck Fleetwood-Smith conceding 298 runs in England's world record total of 7/903. Ross Gregory, a notable young batsman who played two Tests before the war, was killed in the war. However, the team rebounded to win five consecutive series in the latter half of the 1950s, first under the leadership of Ian Johnson, then Ian Craig and Richie Benaud. The series against the West Indies in the 1960–61 season was notable for the Tied Test in the first game at the Gabba, which was the first in Test cricket. Australia ended up winning the series 2–1 after a hard-fought series that was praised for its excellent standards and sense of fair play. Stand-out players in that series as well as through the early part of the 1960s were Richie Benaud, who took a then-record number of wickets as a leg-spinner and who also captained Australia in 28 Tests, including 24 without defeat; Alan Davidson, who was a notable fast-bowler and also became the first player to take 10 wickets and make 100 runs in the same game in the first Test; Bob Simpson, who also later captained Australia for two different periods of time; Colin McDonald, the first-choice opening batsman for most of the 1950s and early '60s; Norm O'Neill, who made 181 in the Tied Test; Neil Harvey, towards the end of his long career; and Wally Grout, an excellent wicket-keeper who died at the age of 41. In May 1977, Kerry Packer announced he was organising a breakaway competition – World Series Cricket (WSC) – after the Australian Cricket Board (ACB) refused to accept Channel Nine's bid to gain exclusive television rights to Australia's Test matches in 1976. Packer secretly signed leading international cricketers to his competition, including 28 Australians. Almost all of the Australian Test team at the time were signed to WSC – notable exceptions including Gary Cosier, Geoff Dymock, Kim Hughes and Craig Serjeant – and the Australian selectors were forced to pick what was generally considered a third-rate team from players in the Sheffield Shield. Former player Bob Simpson, who had retired 10 years previously after a conflict with the board, was recalled at the age of 41 to captain Australia against India. Jeff Thomson was named deputy in a team that included seven debutants. Australia managed to win the series 3–2, mainly thanks to the batting of Simpson, who scored 539 runs, including two centuries; and the bowling of Wayne Clark, who took 28 wickets. Australia lost the next series 3–1 against the West Indies, which was fielding a full strength team; and also lost the 1978–79 Ashes series 5–1, the team's worst Ashes result in Australia. Graham Yallop was named as captain for the Ashes, with Kim Hughes taking over for the 1979–80 tour of India. Rodney Hogg took 41 wickets in his debut series, an Australian record. WSC players returned to the team for the 1979–80 season after a settlement between the ACB and Kerry Packer. Greg Chappell was reinstated as captain. The 1990s and early 21st century were arguably Australia's most successful periods, unbeaten in all Ashes series played bar the famous 2005 series and achieving a hat-trick of World Cups. This success has been attributed to the restructuring of the team and system by Border, successive aggressive captains, and the effectiveness of several key players, most notably Glenn McGrath, Shane Warne, Justin Langer, Matthew Hayden, Steve Waugh, Adam Gilchrist, Michael Hussey and Ricky Ponting. Following the 2006/07 Ashes series which Australia won 5 nil, Australia slipped in the rankings after the retirements of key players. In the 2013/14 Ashes series, Australia again defeated England 5 nil and climbed back to third in the ICC International Test rankings. In February/March 2014, Australia beat South Africa, the number 1 team in the world, 2–1 and overtook them to return to the top of the rankings. In 2015, Australia won the World Cup, losing just one game for the tournament. As of December 2018[update], Australia was ranked fifth in the ICC Test Championship, sixth in the ICC ODI Championship and fourth in the ICC T20I Championship. On 25 March 2018, during the third Test match against hosts South Africa; players Cameron Bancroft, Steve Smith, David Warner and the leadership group of the team were implicated in a ball tampering scandal. Smith and Bancroft admitted to conspiring to alter the condition of the ball by rubbing it with a piece of adhesive tape containing abrasive granules picked up from the ground (it was later revealed that sandpaper was used). Smith stated that the purpose was to gain an advantage by unlawfully changing the ball's surface in order to generate reverse swing. Bancroft had been filmed tampering with the ball and after being informed he had been caught, he was seen to transfer a yellow object from a pocket to the inside front of his trousers to hide the evidence. Steve Smith and David Warner were stood down as captain and vice-captain during the third Test while head coach, Darren Lehmann was suspected to have assisted Cameron Bancroft to tamper the ball. The ICC imposed a one-match ban and 100%-match-fee fine on Smith, while Bancroft was fined 75 per cent of his match fee and received 3 demerit points. Smith and Warner were both stripped of their captaincy roles by Cricket Australia and sent home from the tour (along with Bancroft). Tim Paine was appointed as captain for the fourth Test. Cricket Australia then suspended Smith and Warner from playing for 12 months and Bancroft for 9 months. Smith and Bancroft cannot be considered for leadership roles for 12 months after the suspension, while Warner is barred permanently from leadership. In the aftermath of these events, Darren Lehmann announced his resignation as head coach at the end of the series. On 8 May 2018, Tim Paine was also named as ODI captain and Aaron Finch was re-inserted as T20I captain hours later. On 7 October 2018, Australia played their first Test match under new coach Justin Langer and new leadership group, which included Tim Paine as Australia's 46th Test captain. For Test matches, the team wears Cricket Whites, with an optional sweater or sweater-vest with a green and gold V-neck for use in cold weather. The sponsor's (currently Alinta for home matches and Qantas for away matches) logo is displayed on the right side of the chest while the Cricket Australia coat-of-arms is displayed on the left. If the sweater is being worn the coat-of-arms is displayed under the V-neck and the sponsor's logo is again displayed on the right side of the chest. The baggy green, the Australian cricket cap, is considered an essential part of the cricketing uniform and as a symbol of the national team, with new players being presented with one upon their selection in the team. The helmet also prominently displays the Australian cricketing coat-of-arms. At the end of 2011, ASICS was named the manufacturer of the whites and limited over uniforms from Adidas, with the ASICS logo being displayed on the shirt and pants. Players may choose any manufacturer for their other gear (bat, pads, shoes, gloves, etc.). In One Day International (ODI) cricket and Twenty20 International cricket, the team wears uniforms usually coloured green and gold, the national colours of Australia. There has been a variety of different styles and layouts used in both forms of the limited-overs game, with coloured clothing (sometimes known as "pyjamas") being introduced for World Series Cricket in the late 1970s. The Alinta or Qantas logo is prominently displayed on the shirts and other gears. The current home ODI kit consists of green as the primary colour and gold as the secondary colour. The away kit is the opposite of the home kit with gold as the primary colour and green as the secondary colour. The home Twenty20 kit consists of black with the natural colours of Australia, green and gold strips. However, since Australia beat New Zealand at the MCG in the 2015 Cricket World Cup wearing the gold uniform, it has also become their primary colour, with the hats used being called 'floppy gold', formerly known as 'baggy gold', a limited-overs equivalent to a baggy green. Until the late 2000s, in the ODIs, Australia wore yellow helmets, before switching to green helmets. Former suppliers were Asics (1999), ISC (2000–2001), Fila (2002–2003) and Adidas (2004–2010) among others. Before Travelex, some of the former sponsors were Coca-Cola (1993–1998), Fly Emirates (1999) and Carlton & United Breweries (2000–2001). This lists all the active players who have played for Australia in the past year (since 30 March 2018) and the forms in which they have played in that time, along with any players outside this criteria who've been selected in the team's most recent squad (these players appear in italics). For the 2019–20 season, Cricket Australia's National Selection Panel (NSP) have announced 20 players contracted to the national side from which selectors choose Test, One-day and Twenty20 International teams. Salaries are based on a player ranking system decided by the NSP as well as match fees, tour fees and prize money for on-field success. Uncontracted players remain eligible for selection and can be upgraded to a Cricket Australia contract if they gain regular selection. Australia is the most successful Test team in cricketing history. It has won more than 350 Test matches at a rate of almost 47%. The next best performance is by South Africa at 37%. Australia have been involved in the only two Tied Tests played. The first occurred in December 1960, against the West Indies in Brisbane. The second occurred in September 1986, against India in Madras. Australia's largest victory in a Test match came on 24 February 2002. Australia defeated South Africa by an innings and 360 runs in Johannesburg. Australia holds the record for the most consecutive wins with 16. This has been achieved twice; from October 1999 to February 2001 and from December 2005 to January 2008. Australia shares the record for the most consecutive series victories winning 9 series from October 2005 to June 2008. This record is shared with England. Australia's highest total in a Test match innings was recorded in Kingston, Jamaica against the West Indies in June 1955. Australia posted 758/8 in their first innings, with five players scoring a century. Australia's lowest total in a Test match innings was recorded in Birmingham against England in May 1902. Australia were bowled all out for 36. The first Test in the 1894–95 Ashes. The third Test of the 1981 Ashes. The second Test in the 2000–01 Border-Gavaskar Trophy series against India. Against India in March 2013, Australia became the first team in Test history to declare in their first innings and then lose by an innings. In the 2013–14 Ashes series, Australia took all 100 wickets on offer in the 5–0 sweep over England. Ricky Ponting and Steve Waugh have played in the most Test matches for Australia, both playing in 168 matches. Charles Bannerman faced the first ball in Test cricket, scored the first runs in Test cricket and also scored the first Test century. Charles Bannerman also scored 67.34% of the Australian first innings total in match 1. This record remains to this day as the highest percentage of a completed innings total that has been scored by a single batsman. Ricky Ponting has scored the most runs for Australia in Test cricket with 13,378 runs. Allan Border is second with 11,174 runs in 265 innings while Steve Waugh has 10,927 in 260 innings. Allan Border was the first Australian batsman to pass 10,000 and 11,000 Test runs. Ricky Ponting was the first Australian batsman to pass 12,000 and 13,000 Test runs. Matthew Hayden holds the record for the most runs in a single innings by an Australian with 380 in the first Test against Zimbabwe in Perth in October 2003. Donald Bradman holds the record for the highest average by an Australian (or any other) cricketer of 99.94 runs per dismissal. Bradman played 52 Tests, scoring 29 centuries and a further 13 fifties. Ricky Ponting holds the record for the most centuries by an Australian cricketer with 41. Former Australian captain Steve Waugh is in second position with 32 centuries from 260 innings. Allan Border holds the record for the most fifties by an Australian cricketer with 63 in 265 innings. Adam Gilchrist holds the record for the fastest century by an Australian. Glenn McGrath holds the record for the most ducks by an Australian cricketer with 35 in 138 innings. Billy Midwinter picked up the first five-wicket haul in a Test innings in match 1. Fred Spofforth performed Test cricket's first hat-trick by dismissing Vernon Royle, Francis McKinnon and Tom Emmett in successive balls. Fred Spofforth also took the first 10-wicket match haul in Test cricket. Shane Warne holds the record for the most wickets by an Australian cricketer with 708 wickets in 145 Test matches. Arthur Mailey holds the record for the best bowling figures in an innings by an Australian cricketer with 9/121 against England in February 1921. Bob Massie holds the record for the best bowling figures in a match by an Australian cricketer with 16/137 against England in June 1972. That was also his first Test match for Australia. J. J. Ferris holds the record for the best bowling average by an Australian bowler, taking 61 wickets at 12.70 in his career. Clarrie Grimmett holds the record for the most wickets in a Test series with 44 against South Africa in 1935–36. Ricky Ponting holds the record for the most catches in a career by an Australian fielder with 196 in 168 matches. Jack Blackham performed the first stumping in Test cricket in match 1. Adam Gilchrist holds the record for the most dismissals in a career by an Australian wicketkeeper with 416 in 96 matches. Australia's highest total in a One Day International innings is 434/4, scored off 50 overs against South Africa in Johannesburg on 12 March 2006. This was a world record score before the South Africans later surpassed it in the same match. Australia's lowest total in a One Day International innings is 70. This score has occurred twice; once against England in 1977 and once against New Zealand in 1986. Australia's largest victory in One Day International cricket is 275 runs. This occurred against Afghanistan at the 2015 World Cup in Australia. Australia are the only team in the history of the World Cup to win 3 consecutive tournaments; 1999, 2003 and 2007. Australia went undefeated at the World Cup for a record 34 consecutive matches. After being defeated by Pakistan in 1999, Australia would remain unbeaten until they were again defeated by Pakistan in 2011. Australia have won the most World Cups – 5. Ricky Ponting has played in the most One Day International matches for Australia, playing 375 matches. Ricky Ponting has the most One Day International runs by an Australian batsman with 13,291. Ricky Ponting has the most One Day International centuries by an Australian batsman with 30. Ricky Ponting has the most One Day International fifties by an Australian batsman with 82. Ricky Ponting is the first Australian batsman to pass 10,000 One Day International runs. Shane Watson has the highest individual not out score in an innings by an Australian batsman with 185*. Shane Watson has hit the most sixes in a single innings by an Australian player with 15. Phillip Hughes was the only Australian player to score a century on debut in One Day International cricket. Glenn McGrath has the most One Day International wickets by an Australian bowler with 381. Glenn McGrath has the best bowling figures by an Australian bowler with 7/15. Brett Lee has the most five-wicket hauls by an Australian bowler with 9. Ricky Ponting has the most catches taken by an Australian fielder with 154. Adam Gilchrist has the most dismissals by an Australian wicketkeeper with 470. Adam Gilchrist has the most catches taken by an Australian wicketkeeper with 416. Adam Gilchrist has the most stumpings made by an Australian wicketkeeper with 54. The team song is "Under the Southern Cross I Stand", which is sung by the players after every victory and "treated with reverential consideration and respect" within the team. The official lyrics are as follows, though when it is sung by the players, the word "little" in the last line is instead replaced by "bloody" or an expletive. The authorship of this "Under the Southern Cross I Stand" is credited to former wicketkeeper Rod Marsh, who was apparently inspired by Henry Lawson's 1887 poem, "Flag of the Southern Cross". Marsh initially had the role of leading the team in singing it and, on his retirement, passed it on to Allan Border. The other players to have taken on the role are David Boon (when Border took over the captaincy), Ian Healy (on Boon's retirement), Ricky Ponting (on Healy's retirement), Justin Langer (when Ponting took over the captaincy). The role was then passed on to Michael Hussey, who took it on when Langer retired in January 2007. Following Hussey's retirement on 6 January 2013, he announced that he would be handing the duties over to Nathan Lyon. ^ "Pakistan retain top T20 ranking after ICC error". samaa.tv. 23 February 2018. Retrieved 23 February 2018. ^ "Records / Test matches / Team records / Results summary". ESPNcricinfo. Retrieved 7 January 2019. ^ a b "ICC Test Rankings". ICC. 24 February 2019. Retrieved 27 February 2019. ^ "Records | One-Day Internationals | ESPN Cricinfo". ESPNcricinfo. Retrieved 1 January 2019. ^ a b "ICC ODI Rankings". ICC. 10 March 2019. Retrieved 10 March 2019. ^ "World Cup day 29 as it happened". BBC News. 19 March 2011. ^ "Records | ESPN Cricinfo". ESPNcricinfo. Retrieved 8 July 2018. ^ "ICC T20I Rankings". ICC. 6 March 2019. Retrieved 6 March 2019. ^ "Victor Trumper | Cricket Players and Officials". ESPNcricinfo. Retrieved 14 January 2011. ^ mohankaus (17 January 2009). "ICC's "Best Ever" batsmen and bowlers!". i3j3Cricket :: A blog for fans of Indian cricket... Retrieved 14 January 2011. ^ "The 10 Greatest Batsmen Ever". World Cricket Watch. 15 October 2009. Archived from the original on 11 February 2011. Retrieved 14 January 2011. ^ Remembering the 1977 Centenary Test – The Roar. Published 1 November 2009. Retrieved 4 May 2011. ^ "ICC T20I Rankings". ICC. 23 December 2018. Retrieved 1 January 2018. ^ "The leadership group of the Australian cricket team including Steve Smith and David Warner to be questioned for the foul play relating to admission of ball tampering controversial scandal". news.com.au. Retrieved 27 March 2018. ^ O'Halloran, Kate (25 March 2018). "Steve Smith and David Warner brings disgrace to Australian cricket over ball tampering row". The Guardian. Retrieved 27 March 2018. ^ a b "Tampering trio learn their fate". cricket.com.au. Retrieved 28 March 2018. ^ "This is Australia's moment of truth". ESPNcricinfo. Retrieved 27 March 2018. 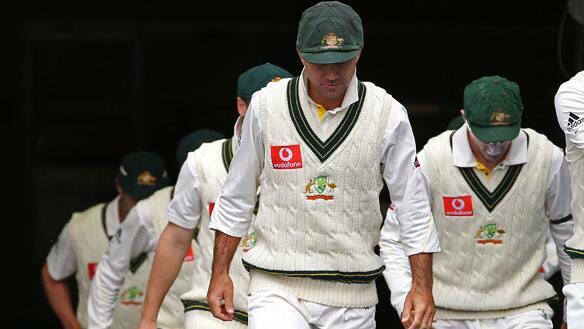 ^ "Aussies face questions over Ashes conduct". NewsComAu. Retrieved 27 March 2018. ^ "Desperation drove Australia to cheat – Smith". ESPN Cricinfo. 24 March 2018. Retrieved 26 March 2018. ^ "Smith, Warner, Lehmann in sights as Sutherland flies to SA". ESPNcricinfo. Retrieved 27 March 2018. ^ "Steve Smith suspended and Bancroft handed three demerit points". ICC media release. 25 March 2018. ^ a b "Paine to be Australia's 46th Test captain". cricket.com.au. Retrieved 27 March 2018. ^ "Darren Lehmann steps down as Australian cricket coach over ball-tampering scandal". ABC News. Retrieved 30 March 2018. ^ a b "Paine to captain Aussies in ODIs". cricket.com.au. Retrieved 7 May 2018. ^ a b c d "New skippers in, Swepson named for white-ball tours". cricket.com.au. Retrieved 8 May 2018. ^ "Photograph: Ricky Ponting, 2010". CBC News. Retrieved 7 January 2017. ^ "ASICS unveil new uniforms – Cricket Australia". Cricket.com.au. Archived from the original on 12 December 2011. Retrieved 22 July 2013. ^ "Floppy Gold to rival Baggy Green?". cricket.com.au. Retrieved 12 January 2016. ^ "Pattinson in as CA reveals contract list". Cricket Australia. 15 April 2019. Retrieved 15 April 2019. ^ "ODI/Twenty20 shirt numbers". ESPNcricinfo. 19 May 2005. Retrieved 8 September 2015. ^ "CricInfo Test Results by Country page". ESPNcricinfo. Archived from the original on 29 January 2007. Retrieved 22 July 2013. ^ "1st Test: Australia v West Indies at Brisbane, Dec 9–14, 1960 | ESPN Cricinfo". ESPNcricinfo. Retrieved 22 July 2013. ^ "1st Test: India v Australia at Chennai, Sep 18–22, 1986 | ESPN Cricinfo". ESPNcricinfo. Retrieved 22 July 2013. ^ "1st Test: South Africa v Australia at Johannesburg, Feb 22–24, 2002 | ESPN Cricinfo". Content-aus.cricinfo.com. Retrieved 22 July 2013. ^ "Records | ESPN Cricinfo". ESPNcricinfo. Retrieved 22 July 2013. ^ "5th Test: West Indies v Australia at Kingston, Jun 11–17, 1955 | ESPN Cricinfo". Content-aus.cricinfo.com. Retrieved 22 July 2013. ^ "1st Test: England v Australia at Birmingham, May 29–31, 1902 | ESPN Cricinfo". Content-aus.cricinfo.com. Retrieved 22 July 2013. ^ "Tests – Victory after Following-On". ESPNcricinfo. Archived from the original on 27 June 2004. Retrieved 2 October 2009. ^ "BBC Sport – India v Australia: Collapse helps hosts take 2–0 lead". BBC. 5 March 2013. Retrieved 22 July 2013. ^ "Aussies raise the bat, with the ball". Youtube. Retrieved 7 January 2017. ^ Gideon Haigh (7 August 2016). "What do we know about the first Test cricketer?". www.espncricinfo.com. Retrieved 27 January 2018. ^ "Batsmen Scoring more than 50% of Innings Total (where side dismissed)". Howstat!. Retrieved 30 December 2010. ^ "Cricket Records | ESPN Cricinfo". Content-aus.cricinfo.com. Retrieved 22 July 2013. ^ a b "Cricket Records | Most fifties (and over) | ESPN Cricinfo". Content-aus.cricinfo.com. Retrieved 22 July 2013. ^ a b "1st Test: Australia v England at Melbourne, Mar 15–19, 1877 | ESPN Cricinfo". Content-aus.cricinfo.com. Retrieved 22 July 2013. ^ a b "Records | Hat-tricks | ESPN Cricinfo". ESPNcricinfo. Retrieved 22 July 2013. ^ "4th Test: Australia v England at Melbourne, Feb 11–16, 1921 | ESPN Cricinfo". Content-aus.cricinfo.com. Retrieved 22 July 2013. ^ a b "Cricket Records | ESPN Cricinfo". Content-aus.cricinfo.com. Retrieved 22 July 2013. ^ "J.J. Ferris | ESPN Cricinfo". Content-www.cricinfo.com. Retrieved 22 July 2013. ^ "Cricket Records | ESPN Cricinfo". Content-aus.cricinfo.com. Retrieved 5 September 2015. ^ "5th ODI: South Africa v Australia at Johannesburg, Mar 12, 2006, | ESPN Cricinfo". Content-aus.cricinfo.com. Retrieved 22 July 2013. ^ "Cricket Records | One-Day Internationals | ESPN Cricinfo". Content-aus.cricinfo.com. Retrieved 22 July 2013. ^ "31st Match: Australia v Namibia at Potchefstroom, Feb 27, 2003 | ESPN Cricinfo". Content-aus.cricinfo.com. Retrieved 22 July 2013. ^ a b Stevenson, Andrew (2 January 2007). "Tune in for a new voice in victory". The Age. Australia. ^ "Cricket Australia FAQ". Cricket.com.au. Archived from the original on 8 December 2010. Retrieved 30 December 2010. ^ "Australia v Sri Lanka, 3rd Test, Sydney, 4th day Report : Retiring Hussey steers Australia to victory | Cricket News". ESPNcricinfo. 6 January 2013. Retrieved 22 July 2013. Townsend, Stephen; Osmond, Gary; Phillips, Murray G. "Wicked Wikipedia? Communities of Practice, the Production of Knowledge and Australian Sports History." International Journal of the History of Sport (2013) 30#5 pp 545–559. How Wikipedia covers Australian cricket. Wikimedia Commons has media related to Australia national cricket team.